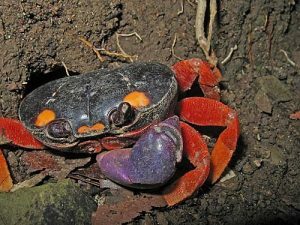 Vibrant, showy, and brilliantly bold, Halloween Crabs are named, and famed, for their colorful costumes. They have a dark brown uppercase that is often confused for black, a bright orange body and purple claws and limbs. Their eyes are a vibrant yellow, complemented by two white spots at the rear part of their carapace. Many people are taken with the crabs’ appearance and choose to make these lively creatures their pets. They are amazingly easy to handle and care for. Proper enclosure and careful measures of temperature and humidity will keep these crabs living a happy lifespan of up to ten years! Crabs are unique species that can be found throughout the world’s tropical and semi-tropical regions. There are three principal groups distinguished by habitat: freshwater, semi-terrestrial and terrestrial (land). Halloween Crabs are land crabs belonging to the Gecarcinidae family. Although they lead a terrestrial existence, at some time during adulthood, the crabs visit the sea for reproduction. Halloween Crabs are found along river banks, mangroves, and rainforests from the Gulf of California in Mexico as far south as Colombia. Humid habitats like these provide the water sources the crabs depend on to prevent lung desiccation. As more water becomes available towards the interior of a country, the more common it is to find these crabs significantly away from the coast. 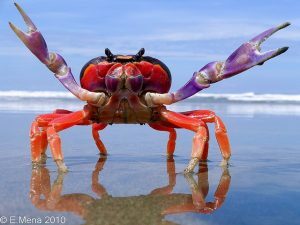 For example, in Southern Costa Rica, the crab can be found up to 600 meters inland. The unique diet and behavior of Halloween Crabs is fitting of the name. Largely nocturnal, the crabs spend their nights climbing trees and burrowing in underground holes. These holes function mainly as the crabs’ store houses. The leaves and seeds of the next day’s meal are hoarded away to be kept safe and dry for these hungry Halloween crabs. While the crabs are mainly herbivorous, they can also eat fish, insects, worms, apples and other fruits and animals. This entry was posted in Marine Conservation. Bookmark the permalink.